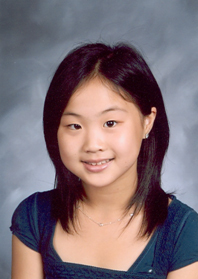 Susie Lee is 6th grade in Crone Jr. High School in Naperville. She began playing the piano when she was five years old with her Mom (Hyen S. Lee). Susie currently studies piano with Mr. Emilio del Rosario at the Music Institute of Chicago. Her former piano teacher was Dr. Ching R. Cheung at College of Du-Page. Susie won prizes at many competitions including Granquist Geneva Competition, New Praise Society Piano Competition in 2005, St. Charles Music Festival in 2006. She was invited to Carnegie Hall as a winner of New Praise Society Piano Competition in June of 2005 and Norris Hall as a winner of St. Charles Music Festival in July 2006. She also plays the piano in her school Jazz Ensemble. Susie’s other interests include swimming, reading and dancing.